It is the season for weddings! The most auspicious occasion for two people who are going to be joined together for life. As always we understand how you would like to plan your gifting for the season, given that so many occasions come together. 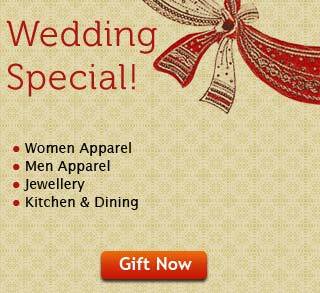 Thus, Tajonline.com has put together a special wedding gifting collection especially for our loyal customers! Our exclusive wedding collection extends from beautiful designer sarees and lehengas to exclusive diamond, kundan and gold jewellery which you can gift your loved ones on their joyous occasion. Deluxe bedding and home décor items to help them decorate their new home. Many couples upgrade their kitchen with top-notch appliances. Gift them the latest gadgets and cookware that look as good on the counter as they do when in use. Holiday packages make an excellent gift for couples plannign a honeymoon. Send perfect flowers for the occasion since, no occasion is complete without flowers. With the perfect gift selection, you ensure that the happy couple are now ecstatic! ← Pre-order offers to light up your Diwali !